In this hugely competitive part of the market the Sonix kit makes a strong case for consideration. While a budget set of drums is never going to be able to compete with a high-end kit, the build and sound quality needs to be up to scratch. With the exception of a couple of details, the Sonix kit is solidly made and performs well - very well in certain areas. For the price, this is a solidly made, decent-sounding set. East Midlands-based Percussion Plus has been manufacturing and distributing percussion instruments for over two decades. Though specialising in tuned and educational percussion, the company has always offered a good selection of drums, cymbals and hardware. 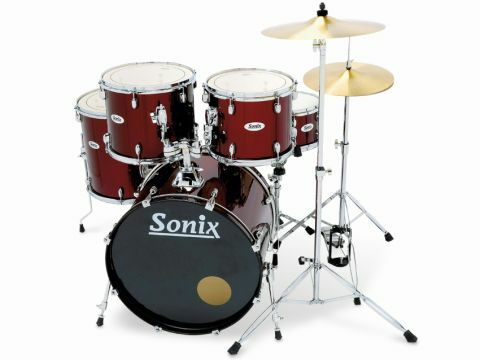 Its all-new Sonix drum kit has been developed in response to customer feedback and dealer advice. "The kit is intended to be an all-in-one package that allows a novice to begin playing without having to fork out for anything else." Sonix kits come in two versions, Rock and Fusion. Sent for review is the Rock variant which is made up of a 22"x16" bass drum, 14"x6.5" snare, 12"x10" and 13"x11" toms and a 16"x16" floor tom. The Fusion kit features the same snare drum with a smaller-sized bass drum and floor tom (20"x16", 10"x8", 12"x10" and 14"x14"). Both kits are intended to be an all-in-one package that allows a novice to begin playing without having to fork out for anything else. To this end all the relevant hardware is supplied (including a stool) along with some basic cymbals (a pair of hi-hats and a crash) and a pair of 5A sticks. The drums are made in China and are constructed from poplar, a medium hardwood. Though inexpensive, poplar has long featured in drum manufacture and is generally reckoned to be closest to birch and mahogany in sonic terms. The shells are a uniform six-ply and are 6.5mm thick. Bearing edges are carefully cut at 45 degrees and generous snare beds are incorporated into the resonant side of the snare drum. A new low-mass lug design graces the drums, replacing the large rectangular versions found on old Percussion Plus kits. Based on the classic bullet shape and featuring diagonal creases each side, they make for a less cluttered, more contemporary look. Also new are the rubber gaskets that line the holes in the shells where the lugs are fixed. The lug count is perfectly acceptable for each drum, with the exception of the floor tom, which has a mere six spaced around its 16" diameter. The choice of heads prioritises the quality of those occupying the batter side over those on the resonant end. Chinese-manufactured Remo UT pinstripe-style heads are fitted on the toms and bass drum while the snare has a coated white single-ply UT head. For what must be budgetary reasons the resonant heads are all unbranded. Four wrapped finishes are available and are simply titled black, blue, silver and, as worn by the review kit, red. A fine sparkle is contained within the wrap, which gives the drums a subtle visual lift. The hardware on the kit has been upgraded from previous designs and the swing out bass drum spurs and ball and socket tom holders wouldn't look out of place on more expensive drums. Setting the kit up was straightforward, with everything locking into place smoothly. Without any damping, the initial response of the bass drum was of boominess. Fortunately, the ported front head allows easy access for inserting damping materials. Adding a small amount calmed the boom down without stifling the drum's natural resonance. The sound is quite hard and is closer to a slap than the sort of dry response common in today's stretched bass drums. It can be tuned down to a reasonably low note without losing its focus. In fact, it carries well enough to have your neighbours (and possibly the people next door to them) complaining. The toms were the strongest elements of the kit, delivering a performance that would be convincing many price bands up. They punched through impressively while giving a clean response that was free of overtones. A large amount of this must be down to the presence of the UT heads, whose inclusion ensured that a deep, fat note was present in each drum. Even the floor tom, with its paltry allocation of lugs, fared well. The matching snare produced an authentic woody mix of warmth and bite and had a good degree of sensitivity. However, the moment the sticks wandered from the very centre of the head the snare wires began to rattle. Adjusting the wires via the flimsy throw-off did little to control the buzz. Despite this, we enjoyed playing the snare as it responded so keenly to dynamic variations.